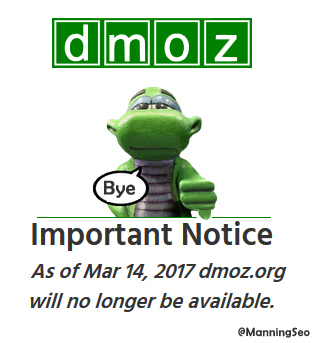 The time for open directory DMOZ.org to close is nearing. On March 14, 2017 they will officially go off-line. Seeing that in the past year they had a full site redesign this is a tad bit surprising. Clearly they were looking for options for ways to entice people to keep them interested in open directory. Still the biggest factor for me like most was actually getting anything listed or changed for that matter. Also, there’s the underlying question with a lot of the free directories themselves. If DMOZ, the biggest and most dominating directory online wasn ‘t able to make it work and adapt to the outside worlds needs, how are the other directories going to hold out. BOTW.org has adapted moreso with adding more features for the local markets. Theirs is a Paid directory model, so they need something that will help their company be profitable and keep up with good quality listings. Once upon a time I used to be an editor open directory. This was for a number of years covering cities that I used to live in Kelowna, BC and my current hometown Corner Brook Newfoundland. Also some of my favourite bands/Artists I was an editor for their category (Ozzy, Big wreck, and Queensryche, just to name a few). To be an editor certainly was time-consuming and something an individual has to be committed to, working to help better their small section of the web. Ultimately my downfall for not being in there anymore was overzealous market in real estate listings. For me it seem like virtually everybody wanted to be a realtor in the mid 2000’s, and they all had sites and submitted it to open directory. So the love for editing was lost. While I do work in the SEO industry, I always played by the rules as an editor. I didn’t spam and I still don’t like spam. I did try few times afterwards to reapply to be an editor, but the attempts never panned out. I’m not sure why, probably because my affiliation with clients in the Search marketing industry, and DMOZ editors were possibly a bit hesitant due to that. Needless to say if they would have been a bit more lenient with regards to allowing new editors, Maybe participation could have continued to flourish. Even then as an editor, it was not uncommon for it to take a year for websites to be added to a directory category. Being an editor one could view and see how many sites where in submission list and when they were submitted in other categories. One can only imagine how bad it has gotten over the years. Also with sites being submitted to the wrong category, their submissions would most likely be moved over to the appropriate category. If that editor didn’t have privileges there, the submission was back and the end of the list. Speculating as what could be one of the possible reasons as to the demise of open directory, my guess is the ongoing lack of editors, constant build up of submissions and the number of broken links, sites that no longer should be listed. Just the thought of the mountain of submissions that have been piling up must of been daunting. Also the cost of upkeep and possible downward spiral of actual traffic could be Another. Other factors that it is not as useful as other major sites that focus on listing businesses online. Often I’ll be out somewhere and I want to look up up information on a business that I want to visit. I’m looking for current open hours, an overview of the business, pictures (if necessary) and reviews of the business. The only thing that DMOZ offered was a description. For myself, Google My Business and Yelp are much more helpful for what I’m looking for as a local shopper in my area. DMOZ.org, while helpful in the past for SEO link building, with actually using it to find a new business that just opened up, Good luck. It would’ve been nice if there was a way for open directory to evolve more and connect with users better. But that would be one heck of an undertaking, and what would of been the ideal solution? On a side note, if you are a Google Local Guide, there are different levels and small incentives. DMOZ.org at that time, none that I could recall. Just to show you how out of date it is. Here’s one section that I use to manage https://www.dmoz.org/Arts/Music/Bands_and_Artists/B/Big_Wreck/ The official website for Big Wreck isn’t listed. MTVs page only, this only has anything that has the words big wreck in the title. Not that useful for Big Wreck, and the only site that actually works is an interview from 1998. It will be very interesting to see how much of an effect open directory will have on the organic rankings. Granted over the years open directory has most likely been given less weight with influencing organic rankings. So ultimately for me, they were far to strict on allowing new editors for my liking. Not everyone is out there to spam the world. The world continues to move more towards automation.